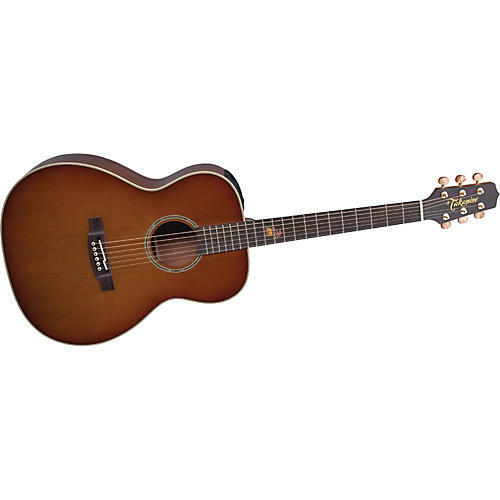 The Takamine TF77PT OM Body Koa Acoustic-Electric Guitar has a rich, golden hue of koa that is instantly pleasing to the eye. The physical structure of the wood presents a visual dimensionality that is found in few other timbers. These lovely aesthetics combined with exceptional sonic qualities makes koa one of the most desirable tonewoods with which to build a sweet guitar. Takamine has chosen to pay homage to this fine timber and the region from whence it comes with the creation of the EF77PT. Built on Takamine's OM body size platform, the TF77PT unites two tonewoods that seem to know how to bring out the best in each other. Solid cedar tops and solid koa back and sides. The result from this particular combination is truly greater than the sum of the parts. The resonant properties of the koa acts on the harmonic wealth of the cedar in such a way that the low notes become more focused and articulate while the higher notes sustain with a richness and clarity that hits the ear with musical abundance. As if the tone of thie TF77PT would not be enough to inspire extended playing sessions, Takamine chose to create a visual appeal that brings to mind the feeling of a tropical island breeze blowing gently through the palms at sunset. The 12th fret inlay is designed to create a little island paradise right in your lap. To complete the look, the soundboard is finished in a light "sunset burst' that accentuates the beauty of the high grade cedar and compliments the natural color of the koa back and sides. The TF77PT is built for pleasure, but it is completely ready, willing and very able to get down to business with a "beyond-state-of-the-art" pickup and preamp system featuring the CTP-2 CoolTube preamp. The CTP-2 has an on-board tube preamp with bass and treble tone controls, a semi-parametric midrange, a second-source input and blend control, and a chromatic tuner.